The best Maldives surf is on the eastern and southern edges of the atolls, which have the best orientation to swell and wind direction. All the surf breaks over coral reefs, with the surfable waves forming at gaps or passes in the reef where channels (“kandu” in the local language) flow in and out of the atoll lagoon. During the Maldives surf season, consistent, straight swell lines produce perfect, peeling waves, clean walls and long, hollow tubes. Many Maldives surf breaks have multiple names. The list below gives the most preferred name first, with alternative names in brackets. The Maldives Surf Season runs from mid February to November, when low pressure systems in the southern Indian Ocean generate consistent swells. The early part of the Maldives surf season has the most stable weather, with light, favourable winds. The Maldives surf swell consistency and size improves from February, with March, April and May having very clean conditions. Swells during the Maldives surf season are consistently from the southeast, which is the ideal direction for nearly all the main breaks in the country. North Male’ Atoll has the biggest concentration of Maldives surf resorts and the most accessible, best-known, and most popular surf breaks in the Maldives. 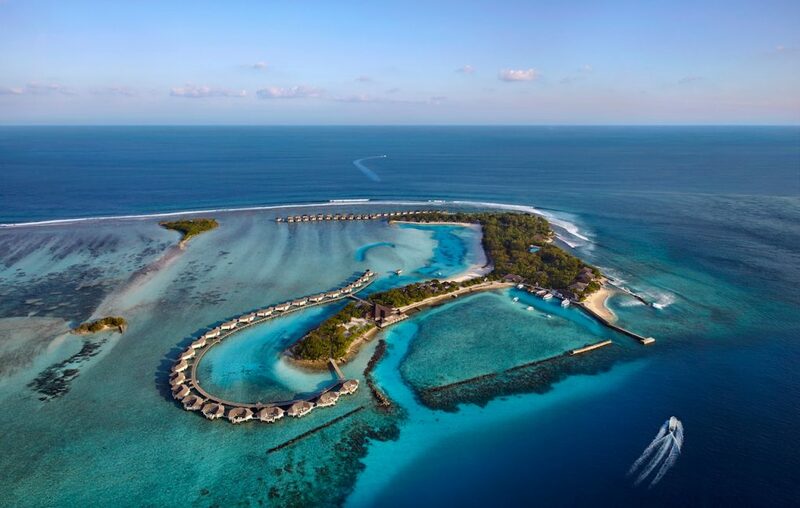 The very best option for surfers is to stay at Cinnamon Dhonveli, which gives exclusive access to Pasta Point, and is very handy to Sultans, Honkys and Jailbreak, as well as all other breaks using Atoll Adventures boats and surf guides. A good alternative is a boat-based Inner Atoll Surf Charter boat trip. Chickens: This long, fast left was one of the first Maldives surf breaks discovered by Tony Hinde when he was wrecked here in the 1970s. At its very best on rising to high tide with a swell over 2m and a light northerly wind, the wave goes up to 500m from a fast walling first section into long barrelling second section – a world class wave for skilled surfers, but great for intermediates in smaller swells. Colas: (Cokes), across the channel from Chickens, this steep, hollow right hander breaks over a shallow reef, and is strictly for advanced surfers when the swell is up. With a big swell and southwest wind, it’s one of the best barrels in the Maldives. Lohis: Two-sectioned left off Lohifushi island – access is restricted only to guests of Huduranfushi Resort, but can still get busy. The sections link up best on a big swell at high tides – with a northerly wind it can be a really long tubing wave. Piddlies (Ninjas): across the channel from Lohis, and accessible to anyone on a boat, this mellow right is a good long-board wave and suitable for beginners. It’s best with a northwest wind (or no wind) on a moderate swell – it closes out over 1.5m. Pasta Point: Breaking over the house reef of the Cinnamon Dhonveli resort, and limited to only 30 guests, this wave is never crowded. It’s a perfect, long, peeling left and probably the most consistent Maldives surf break. Works in winds from southeast, northeast, north and northwest. Small swells (under a metre) are ideal for intermediate surfers. At its best at 2m and over. It’s an easy takeoff to a long wall leading into the ‘Macaroni Bowl’, finishing with a fast, shallow section called ‘Lockjaws’. A classic. Sultans: At the northeastern corner of Thamburudhoo island, this excellent right can handle any size swell. Best at high tide with wind from the south to the west. Even on a small swell it’s a fun, fast wall; over a metre, there’s a great peak takeoff that turns into a thick tube on the inside. The end section reaches barrelling perfection over 2m. Honkys: At the southeastern corner of Thamburudhoo island, Honkys is a mirror to Sultans – a long wrapping left that’s best at low tides and in north to northeast winds, ie when it’s blowing onshore at Sultans. Perfect 150 yard ride with long walls and an inside section that stands up bigger than the takeoff. Best wave in the Maldives on its day. Jailbreak (Jails): Himmafushi island is no longer a jail, but the break at its eastern tip has kept the name. It’s a long, fast right, best in a southwest wind, on a mid to rising tide. On a small swell it works as three sections, but up around 2m the three tube sections connect with long, super fast, walls. Tombstones: (Furana) Off Furana island and the Sheraton Resort, this fickle right-hander needs a big swell to work well. With 2m plus, and a southwest wind, it’s a long, fast, hollow wave. South Male’ Atoll waves are usually a couple of feet smaller than other Maldives surf zones, typically a couple of feet smaller than those in North Male’ Atoll, but they can be excellent if there’s a big swell. Consequently, the season for reliable waves a bit shorter, with April to September being the best months. There are a few resorts here, but none are really set up for surfing. The best option for surfers is a boat-based Inner & Central Atolls Surf Charter trip. Gurus: Across the channel from the tiny island of Gulhi, this left-hand reef break picks up the most southerly swells, and works well with a north wind. If it’s 1.5m or more, it has a long, fast, workable wall. A fun wave for intermediate surfers. Quarters: (Workers) at the south edge of the channel, this small, quick right needs a bigger swell to work. Punchy barrel in the right conditions. Kates: short little left-hander works best with a bigger swell, high tide and a north to northwest wind. Nice, steep take-off with a fast wall ride. Natives: (Foxys) hollow right breaking in shallow water over the reef, this is not for beginners. With a north-west wind and a solid swell it forms long, fast barrelling waves. Kandooma Right: off the Holiday Inn Resort island, exclusive to its guests, this right hander breaks off the eastern edge of the reef with a relatively easy outside take-off. Works best on a bigger swell with a west to northwest wind, when the wave wraps around the reef corner jacking into a fast barrelling wall. Last Stops: (Riptides) fast right in the middle of a channel – beware of strong currents when the tide is running. On a biggish southern swell with a southwest wind it gives a 150m wall with hollow sections and a great bowl towards the end. Longboarders love it; short boards rip it. In terms of Maldives surf zones, the “Central Atolls” generally refers to four atolls between Male and the southern atoll area – from north to south, they are Meemu, Dhaalu, Thaa and Laamu. A couple luxury resorts in these atolls offer access to a surf break or two, but none are especially well set up for surfers. A few local guesthouses may also have surf possibilities. The best way to surf the Central Atolls is on a charter boat which gives best access to the breaks of the different atolls depending on the prevailing swell and wind directions. Flying down on an inter-atoll domestic flight to Laamu Atoll to meet your charter boat is the most time efficient trip itinerary avoiding a couple days of boat travel from Male. A well organised boat trip with very experienced guide will make the most of the conditions when you’re there, and get you onto a variety of the best waves in the region. An advantage of the Central Atolls is the accessibility to breaks that are exposed to the wider range of swell directions from south-west to south-east swells. The best waves are on reefs beside a “kandu” or channel where water flows in and out of the atoll lagoon. The swell direction, tide and wind direction determine the best spot on the day. Most of the best breaks in the Central Atolls are right handers but there are plenty of good lefts as well. The atolls and breaks are listed here from north to south; but most boat charters will start and finish at Laamu being the airport with the most frequent and convenient schedules to connect with international arrival & departure flights at Male’. There’s one main reef pass on Meemu, with several breaks within a short distance. Veyvah (Playgrounds) – On the north side of the channel off Vevah island, this fun lefthander is good for intermediate surfers. Easy take off goes into a long wall that can tube nicely in the right conditions. Mulah Point (Mulhaku) – South of the channel, at the tip of Mulah island, is another fun wave – a nice right hander for intermediates on a small day, but can handle a much bigger swell. Local kids learn to surf here. Mulah (Mulah Left; Pit Stops) – On the other side of the Mulah point, a challenging left hand tube works on bigger swells, higher tides and north wind. In the right conditions it breaks long and fast over a shallow reef. Muli Inside (Formula One; F1) – Off the northern tip of Muli island, this fast right needs a bit of swell and a southwest wind to be at its barrelling best. Long, hollow, shallow at some points but finishes in deeper water. Muli Outside (Mushrooms) – East side of Muli island, so it picks up more swell – a long, tubing right hand point break with an easy exit. Consistent. Best suited to a south-west swell direction Dhaalu has three good breaks on its southern edge. Hocus Pocus (Maaemboodhoo; Screaming Kids) – Off the eastern tip of Maaemboodhoo island is a short, hollow right hand barrel that works in west/southwest winds and a south-west swell. Best surfed at mid to high tides because it breaks over a shallow reef – advanced surfers only. Vodi – Nice left hander that breaks on to the Niyama Resort hotel island mainly surfed by the resort’s guests. Good on a northeast wind and a southwest swell, but can be shallow and shifty. Beginners and longboarders enjoy it on a high tide and a small swell. On a big swell it hollows out to a fast, clean, walling wave. Kasabu (Kudas; Mauroofs) – Right by the airport runway on Kudahuvadhoo island, this quality right hand wave is best with a southwest swell and a northwest wind. It starts working at 1m swells, when beginners get an easy take-off on the end section. On bigger days, better surfers get a longer wrapping ride over 150m. It can handle up to 2m and more, when experts get barrelled along the reef edge for 300m. Share the wave with a few local guys. Bowling Alley (Vandhoo) – Inside the reef channel on the west side of the atoll, this peak produces a fun left hander, and occasionally a right. Works on any tide with a small to medium southwest swell, but it’s best with northeast to southeast winds which are not prevalent. Malik’s (Hirilandhoo) – On the outer edge of the same reef channel, this wave also works best on a southeast wind and a southwest swell. On a good day, it throws up long, fast left-hand barrels from 1 to 3 metres. Adonis (Veymandoo) – Moving to the southern edge of the atoll, beside the channel at the tip of Veymandhoo island, Adonis is a long, fast, hollow, right-hand barrel in the right conditions – a solid swell and a northerly wind. Some sections can get shallow. Outside Mikados (Outside Farms) – Further east, a smaller reef pass catches the southerly swells, and rolls out some high powered barrels. Outside Mikados gets the most of it, and forms a fast, sectiony right that gets bigger and faster as it goes, closing out over jagged reef. Better (and slightly safer) on higher tides and bigger swells (1-2 metres) with a light or northerly wind. Exciting ride for gutsy surfers who can gun it down the line. Inside Mikados (Inside Farms) – Just inside the channel, a more mellow right wraps around the reef producing a picture-perfect, peeling right-hander. Absolutely ideal at mid- to high tide with a medium size southwest swell and a southwest wind. Finnimas – On the other side of the channel is a fast, shallow left hander. It’s a bit fickle, but with a southwest swell and a northeast wind (or no wind at all) it will get you nicely barrelled. Very occasionally, with a solid swell and a west or southwest wind, a peaky right hander forms across the channel. If you’re doing a Central Atoll boat charter, you’ll probably arrive on a domestic flight from Male, landing on the island of Kadhdhoo, on the southeast side of Laamu Atoll. Good surf breaks are on the southern and north-eastern edges of Laamu. Yin Yang (Ying Yang) – At the mouth of a wide channel on the south edge of the atoll, Yin Yang is regarded as one of the best waves in the country. A long, fast right-hander, it starts with a solid barrelling outside section, forms nice walls and bowls as it wraps around the corner, then the inside section gains power and speed all along the reef ledge. It’s like two waves, with the outside best in northwest winds and the inside better with a south-westerly. Pretty consistent, it will work on any tide, in any swell that’s generally from the south. At its very best with very light winds and a southeast swell over 3 metres. It can handle up to 4 metres. Sometimes gets busy, especially if there are surfers from the nearby resort and no other waves working. The inside, end section can be demanding when the swell is up. Madas (Petrols) – At the inside edge of the same channel, this short left is a good alternative to Yin Yans when there’s a bigger southwest swell and a northwest wind. A bit shallow at low tide. Bedhuge (Mundoo) – Heading up the east side of the atoll, on the tip of Mundoo island, this classic, wrapping, righthander needs a bigger southeast swell and a west wind. It’s a small wave that breaks best at lower tides over shallow coral – for advanced surfers. Refugees Lefts (Machine Lefts) – Across the channel from Bedhuge is a series of short, left-hand peaks. With a solid southeast swell and a southwest wind, the sections link up to give a succession of fast and furious drops and a rollercoaster ride. A shallow take-off, heavy waves and strong currents mean it’s not for beginners. Refugees Rights (Machine Rights) – Just to the north is a right hander for surfers who like it fast and furious. It needs a sizeable southwest swell to work, with a sharp take-off over a shallow reef section, shooting into a fast-breaking barrel that doesn’t let you off till the end. Machine (Maahbaidhoo; Tsunamis) – At the northern tip of Mahibadhoo island, this right-hander starts on the outer reef and wraps around into the channel. It’s rideable with a smaller swell and on any tide, but at its best with a bigger southwest swell, incoming tide and southwest wind. In these conditions, it’s a super long, winding barrel, starting outside on a fast, straight reef section, then into a mellow, fun corner, finishing with a final, heavy barrel section. A classic. But this wave demands hard paddling – getting to the take-off, getting out at the end, and fighting the current to get back. It can also crunch you on the reef. Strength and skill required. Isdhoo (Langdon Bank) – At the very north-eastern tip of Laamu Atoll, Isdhoo is a nice right that works well on a big south to south-easterly swell. It’s a bit out-of-the-way, and there’s no suitable anchorage for boats, so it’s not surfed much, just the occasional surf charter boat heading to or from Thaa Atoll. Now well established on the Maldives surf scene, the southern South Huvadhoo Atoll (also called Gaaf Dhaal) has over a dozen named breaks on the reef channels round its southeast coast. There are now some hotel and guest house options but few of them are in the surf zone with a professionally organised surfing program. The best way to surf this region is still with an Outer Atolls Surf Charter. Tigers: (Tiger Stripes; Rockets) This long, wrapping left breaks over a coral reef with parallel grooves like the stripes of a tiger. With a solid swell the tricky take-off leads into a long wall that wraps around and gets faster and steeper into a final barrel section. Antiques: Across the channel from Tigers, its right handed twin is a smaller wave, easier to handle – better for beginners, especially when the swell is bigger. Love Charms: Very reliable left-hander works on any swell, but changes as the swell gets bigger. At low tides with a small swell, it has two sections starting with a hollow wall then some nice little pockets. When it’s bigger, the sections join up in a long, solid wall with a series of barrels. Two Ways: (Twin Peaks; Booga Reef) A more relaxed wave that goes both left and right off the southern tip of the reef. It works at all tides, breaking into deeper water than many of the shallow reefs around, so it’s good for intermediate surfers and a fun wave for everyone. The right needs a slightly bigger swell, but they both work at any swell over a metre with long, peeling walls. Five Islands: (Gani Point) On the southeastern corner of the same reef pass, this long and solid right-hander needs a south swell and a mid- to high tide (can be dangerously shallow at low tide). Needs a swell of well over a metre and handles twice that and more. When the section link up, it’s a long, hollow, barrelling and very fast wave for advanced surfers. Bluebowls: (Voodoos) At the eastern tip of Vaadhoo island, the reef point forms a long, wrapping right hand wave. Good at all tides, and protected from onshore winds, it works on small and large swells but is ideal around 1.5 to 2m with a westerly wind, when it has a whole series of bowl sections linked by smooth walls. Fun wave for shredders and longboarders alike. Castaways: (Dhiraagu) Breaking over the eastern tip of an isolated reef, this right hander is definitely for high tides. The take off is easy, but gets steep fast, and shoots into the speedy end section over shallow reef. A great wave when the swell gets to 2m or more. Beacons: On the western edge of the Fiyoari channel, Beacons is one of the most powerful Maldives surf breaks. A fierce and fickle right, it’s strictly for skilled and serious surfers. Needs a clean southwestern swell to make it peel along the edge of a shallow reef, forming an epic tube. Southeast or even southern swells will close out unpredictably onto the coral. Most Maldive surfers will find a short fun board suitable for most conditions in the Maldives Surf, but bring a longer board for bigger swells. The water is warm enough to swim without a wetsuit, though a light suit or rash vest is a good idea, for protection from the sun and from the coral. Booties are essential for picking your way over exposed coral reefs, and a helmet is recommended. If you’re doing a boat-based surfari holiday, bring all the gear you’ll need because nothing will be available in the atolls. Atoll Adventures has a range of quality Rental Surfboards available at Cinnamon Dhonveli resort.